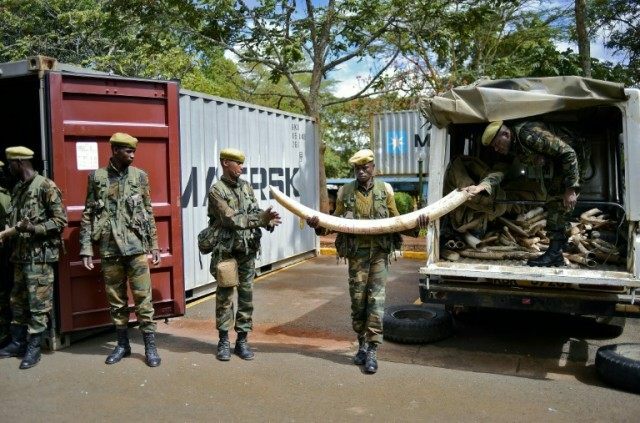 Nairobi (AFP) – Truckloads of elephant tusks arrived in the Kenyan capital Friday, collected from across the east African nation ahead of the world’s biggest burning of ivory later this month. The mass burning, the vast majority of its ivory and rhino horn stockpile, will amount to over 100 tonnes of ivory, seven times the size of any ivory stockpile destroyed so far, as well as 1.35 tonnes of rhino horn. The highly publicised and symbolic gesture against poaching will be led President Uhuru Kenyatta. The tusks were transported under heavy security from regional strongrooms in national parks to KWS headquarters in Nairobi. “The ivory, which is being transported from Voi, Mombasa, Nanyuki and other parts of the country, will make up a significant proportion of an estimated 106 tonnes of elephant tusks to be set ablaze on April 30,” KWS said in a statement. The mass burning is expected to be attended by international celebrities, actors, conservationists and heads of state. Kenya has suggested guests might include Hollywood actors Leonardo DiCaprio and Nicole Kidman, business tycoons George Soros and Howard Buffet, although there has been no formal confirmation of guests. Former basketball star Yao Ming, who has led campaigns in his homeland of China to raise awareness of the damage elephant poaching causes, is also hoped to attend. More than 30,000 elephants are killed for their ivory every year in Africa to satisfy demand in Asia where raw tusks sell for around $1,100 (1,000 euros) a kilogram (2.2 pounds).